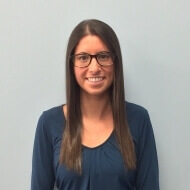 Katie graduated from Quinnipiac University with a Bachelor’s in Health Sciences and a Doctorate in Physical Therapy. She has a wide range of experience in physical therapy across the spectrum of care. Her experiences include working in a skilled nursing facility, outpatient orthopedic settings, and at Spaulding Rehabilitation Hospital in Boston, MA. During her time at Spaulding on the comprehensive medical floor, she gained experience in teaching prosthetic gait trainers to learn how to walk again. Katie’s areas of interest include treating sports related injuries and post operative cases, neurological populations, and the elderly. Originally from Beverly, MA, Katie was a three sport high school varsity athlete in cross country, basketball and track. Outside of the clinic, Katie enjoys cooking, hiking, traveling, going to the beach, and spending time with friends and family. Her other interests include pilates based exercise and running.